Habit: Shrub, tree; generally dioecious or flowers bisexual and unisexual; resin clear, often weathering black, generally aromatic, latex milky or 0. Leaf: simple to ternate- or odd-pinnate-compound, alternate, deciduous or evergreen; stipules 0. Inflorescence: raceme or panicle; flowers generally many. Flower: generally unisexual, radial; sepals generally 5, base generally +- fused; petals 5, generally > sepals, free; (perianth parts 1--7 in Pistacia); stamens 4--7 or 10, vestigial in pistillate flowers; ovary superior, vestigial or 0 in staminate flowers, subtended by +- lobed, disk-like nectary, chamber generally 1, ovule generally 1, styles 1--3. Fruit: drupe, generally +- flat, sticky or not, hairs short or 0; pulp +- resinous, aromatic or not. Genera In Family: 70+ genera, +- 850 species: tropics, warm temperate; some ornamental (Rhus, Schinus), cultivated for fruit (Anacardium, cashew; Mangifera, mango; Pistacia, pistachio). Toxicity: TOXIC: many genera produce contact dermatitis. Habit: Shrub, vine-like or not; generally dioecious. Leaf: +- resinous; leaflets 3--9, thin to +- leathery, entire, toothed, or lobed. Inflorescence: raceme or panicle, axillary, +- open; flowers pedicelled. Flower: stamens 5, vestigial in pistillate flowers; styles +- fused, stigmas 3. Fruit: generally spheric, papery or leathery in age, cream to brown; pulp resinous. Species In Genus: 15 species: America, eastern Asia. Etymology: (Latin: poisonous tree) Toxicity: TOXIC: resin on leaves, stems, fruits causes severe contact dermatitis; one of the most hazardous plants in California. Habit: Shrub, 0.5--4 m, or vine-like, < 25 m. Stem: twigs gray- to red-brown, tapered, hairs 0 to sparse. Leaf: petiole 1--10 cm; leaflets 3(5), +- round to oblong, entire, wavy, or +- lobed, thin to +- leathery, bright red in fall, adaxially glabrous, shiny, abaxially sparse-short-hairy, base truncate to rounded, tip obtuse to rounded; terminal leaflet 1--13 cm, 1--8 cm wide, lateral 1--7 cm, 1--6 cm wide. 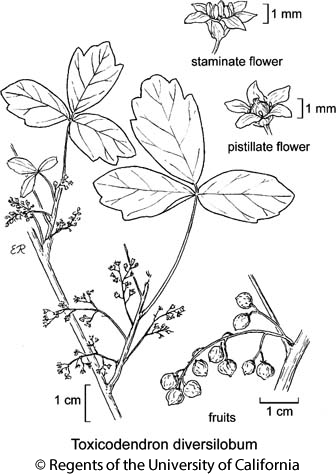 Inflorescence: branches loose, generally arched, slender; pedicels 2--8 mm; bractlets < 1 mm. Flower: sepals green; petals > sepals, generally ovate, yellow- to white-green. Fruit: 1.5--6 mm diam, spheric to +- compressed, glabrous to fine-bristly, creamy white, in age leathery; pulp white, black-striate. Chromosomes: 2n=30. Unabridged Note: A related sp., Toxicodendron rydbergii (Small ex Rydb.) Greene, occurs in southeastern Oregon, Nevada, Utah, western Arizona. Citation for this treatment: John M. Miller & Dieter H. Wilken 2012, Toxicodendron diversilobum, in Jepson Flora Project (eds.) Jepson eFlora, http://ucjeps.berkeley.edu/eflora/eflora_display.php?tid=46791, accessed on April 23, 2019. CA-FP, sw edge DMoj; Markers link to CCH specimen records. Yellow markers indicate records that may provide evidence for eFlora range revision or may have georeferencing or identification issues. Purple markers indicate specimens collected from a garden, greenhouse, or other non-wild location.